Tell us about your trees? Tell us about the help you have received? Tell us how we can communicate with you? What is Operation PGPD ? 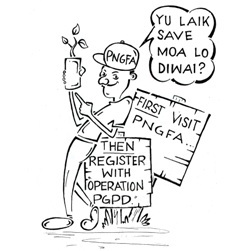 The Operation PGPD Online Gateway supports reforestation planning, decision-making and service delivery at all levels by allowing approved forestry stakeholders to view and analyse the landowner baseline data with reference to tables, charts and maps: .